This sterling silver jewelry charm is a customer favorite! 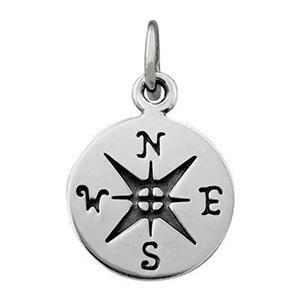 The symbolism of the compass is versatile enough to use in a variety of jewelry design ideas. In the words of the great Ralph Waldo Emerson, "Life is a journey, not a destination." Halstead was super easy to work with on my organization's somewhat difficult and large orders. I had to order in two shipments (both requiring special orders) to match with two awards ceremonies, and I had a very tight budget. The charms were given to mother/daughter teams in my organization who worked a certain number of volunteer hours in our community. Great quality and very nice customer service reps that helped me through the process and got me the charms with plenty of time before the awards ceremonies. Another great product. This is a dainty charm, it looked beautiful combined with an initial charm and birthstone channel drop.